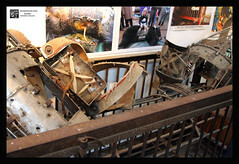 When Diana and met our first moonbear Bam Bam at the Tiger Temple in Thailand in 2008 we were entranced. She was so beautiful and was found as an orphan on the Burma border and fostered to adulthood by the monks. Upon our arrival in Chengdu China about a week later, we were surfing the internet to find where we wanted our guide Mickal to bring us in town. 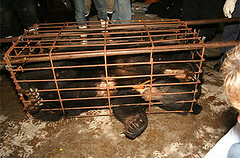 Low and behold on a Google search we found Animals Asia Foundation and the words “moonbear rescue” after it. We asked Mickal first thing as he picked us up in the morning if he could find the place. Being the awesome guide he is and his driver Mr Li were on a mission!!! After a couple of hours and a lot of pit stops asking the locals if they had heard of the place, WE FOUND IT!!! Only to be stopped at the gates by security personel that were fully prepared to turn us away (good security = safe moonbears). AAF is open by appointment and we were not on the schedule that day. There was a group of school children having a field trip that Saturday…yes the kids go to school 6 days a week. Mickal did some very good negotiating , and after showing our passports and getting the “ok” we were ushered into the Moonbear facility….THE REST IS HISTORY!! My goal with the trip this year is to gather information and lots of photos and video to fill my photography book I am writing to benefit AAF called “Shoot for the Moon” which will be available this fall of 2010. 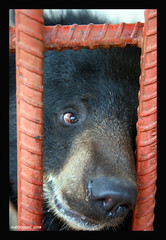 My aim in educating the public about moonbears is to give you all enough information to drive a passion to help , but not as much of the painful images to cause the tender hearted to turn a blind eye…. This is a charity that most certainly hurts the heart to face head on….and is very close to my own heart. 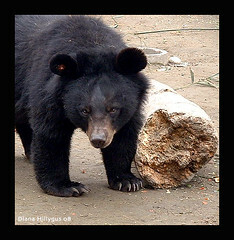 Admitedly….even I can’t dwell on the powerful images of moonbears suffereing….. or I would be useless to rally others to the cause. 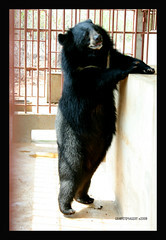 Every single time I get an email saying “I didn’t know what a moonbear was until I met you” I break down and cry…all good tears of course, knowing the networking via my MISSION MOONBEAR is actually making a difference…one person at a time…and it all started with a litte bear named Bam Bam!!! 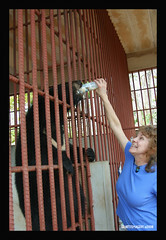 Jill Robinson is the Animals Asia Foundation Founder and CEO, Jill Robinson MBE, began tireless work within China after her horrific discovery of bear bile farming in 1993, resolutely building relationships and negotiating with government departments to bring an end to this cruel practice. 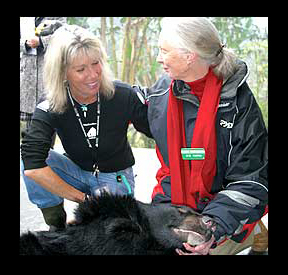 Jill’s dedication and skill in handling culturally sensitive matters led to the signing of a landmark agreement in July 2000 with the China Wildlife Conservation Association (CWCA) and the Sichuan Forestry Department (SFD). 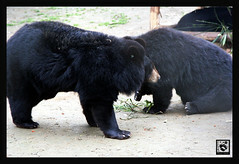 The agreement pledges to free 500 suffering Moon Bears in Sichuan and to work towards the total elimination of bear farming. Sanctioned by the Central Government Department in Beijing, this historic agreement was the first accord between the Chinese Government and any outside animal welfare organisation. Animals Asia Foundation has been profiled on CNN, NPR, Animal Planet, the BBC, the National Geographic Channel, as well as in print media in several countries. Founder Jill Robinson has received numerous distinctions for her commitment to animal welfare including the 2002 Genesis Award, the Reader’s Digest Hero for Today Award and an MBE from the Queen of the United Kingdom.The Foundation’s headquarters is in Hong Kong with additional offices, a sanctuary and an educational centre in China, Germany, Australia, the United States and the United Kingdom. A sad story but an awesome mission taken on by a wonderful person. I am so impressed with all that you and so many dedicated people are achieving. The fact that you and others are making us out here aware of the plight of these creatures is wonderful Thankyou!! I want to comment here, but my brain is just a bit frozen. The tears this brings, reminds me once again that I’m only human. And then I remember it’s humans doing these atrocities. And the anger that comes, is only human. And I want to know how someone could do this? I really don’t think it’s natural for people to do this. Something has gone really wrong. And it’s that humans think only of themselves. Thank you so much for the awareness your bringing to what’s happening. It’s easier to not know these things, but burying my head in the sand is only stupid. Each and every bear that can be helped is a victory. Each and every good change in laws is a victory. 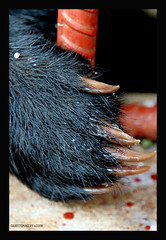 And with every new person that realizes this practice is not beneficial for bear or person, it is a victory. Thank your for letting us follow along in your travel. You are so lucky to meet Jill. It’s a wonderful woman. Please say hello to her She participates to my book with Animal Asia in Hong Kong. Tell Jill I am a huge fan and love AAF for all they do. 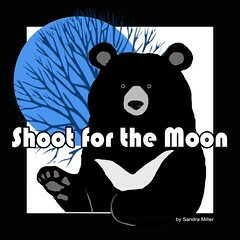 Please send my love to all the Moonbears and hope they are all enjoying their wonderful new and FREE lives!